This trail was designed with mountain bikes in mind, and that becomes immediately apparent as you swoop up, down and around the little coves off the lake. 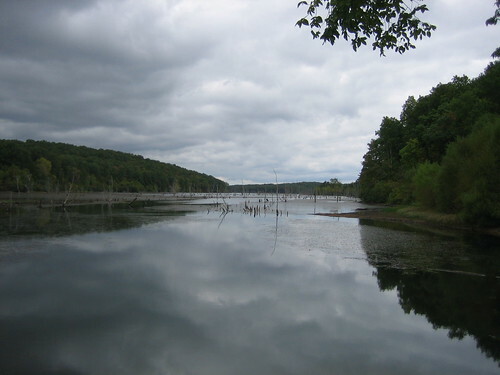 The 11.5 mile Lake Shore Trail winds around Council Bluff Lake, through a few pine and cedar groves, but never strays very far from the shore. Most of the mileage is right next to the water. While there is only modest elevation gain, the constant ups, downs and turns never seem to end. 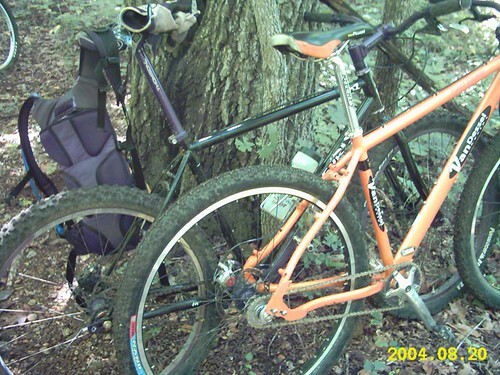 There are many miles of technical trail riding, but nothing too intimidating. The trail is almost entirely singletrack with the exception of an old road bed about a mile long just before the Enough boat ramp, and a gravel road section just northeast of the swim beach. 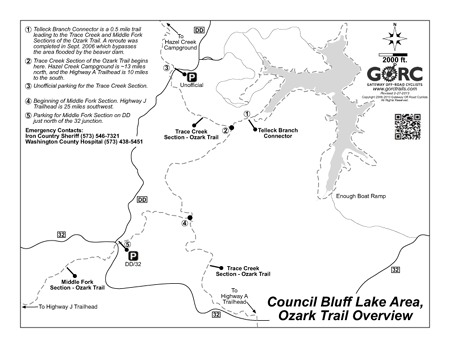 There is also a connector along the Telleck Branch which allows you to connect with 2 major sections of the Ozark Trail: Trace Creek, and Middle Fork. From there you can get in some serious singletrack riding. 25 miles to the Highway J trailhead on the Middle Fork; 16 miles from the Telleck Connector to Hazel Creek Campground by going north on the Trace Creek section, or 8 miles south to the Highway A Trailhead. 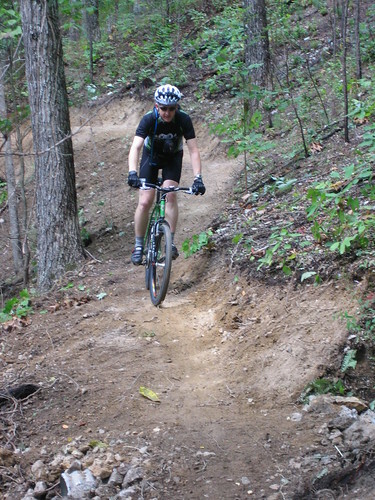 The Ozark Trail Association has just completed a reroute of the connector (Sep. 2006), which puts it up on the hillside and bypasses the flooding caused by the beaver dam. It's a great improvement over the previous trail and now the route from the campground is wide open. There are toilets, water, some concessions, coin-operated showers, and a picnic area at the swim beach which is open in the summer. Toilets and water are at the Wild Boar Ridge campground which is open in late spring and summer and offers spacious wooded campsites. There is also a toilet and a gravel parking lot at the Enough boat launch area. From Potosi, MO go south 13 miles on Hwy P. Turn right on Hwy C, then left on Hwy DD. It's about 7 miles to the sign for Council Bluff Recreation Area. From the South: MO 32 to MO DD. North 3 miles to Council Bluff sign. Turn right. 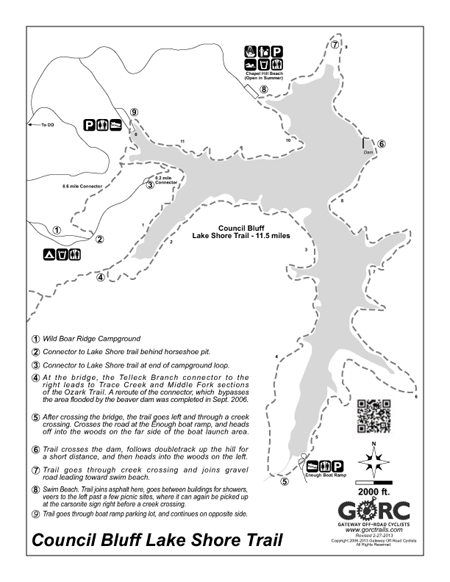 Trailheads are at both the boat ramp and the Wild Boar Ridge Campground. There is a $3 day use fee. Great condition with a just a few muddy spots in a low areas. Trail is in pretty good condition with some soft spots. Dry and super leafy. But it looks like it will be snowing down there tonight. Check that Accumulated Rainfall Website to be sure. Very lonely down there. Good to go! Has like 2-3 soft spots. But the majority is leafy and rocky! Heavy leaf cover on Saturday. Fairly solid firearms deer hunter presence around the lake and cg. Wear Hunter Blaze orange. It's for everyones safety.